Are you responsible for troubleshooting complex systems? Do you manage a service department, a helpdesk, or a customer hotline? Are you looking to measure the performance of your technical support and improve its efficiency? Are you interested in leveraging the latest advances in artificial intelligence for technical support? Could you use a tool that guides and trains your technical support team? Would you like to offer your customers a self-service option for technical support? Are you looking for a way to better maintain the expertise of your organization despite employee turnover? Capitalize on knowledge: encode all the expert knowledge of your organization and share it with all team members involved with technical support. The BEST software suite is a comprehensive set of modules, ready for integration in your existing IT system. It provides the latest and most efficient technologies for decision support for troubleshooting. Troubleshooting Modules serve as the primary decision support tools for service representatives. 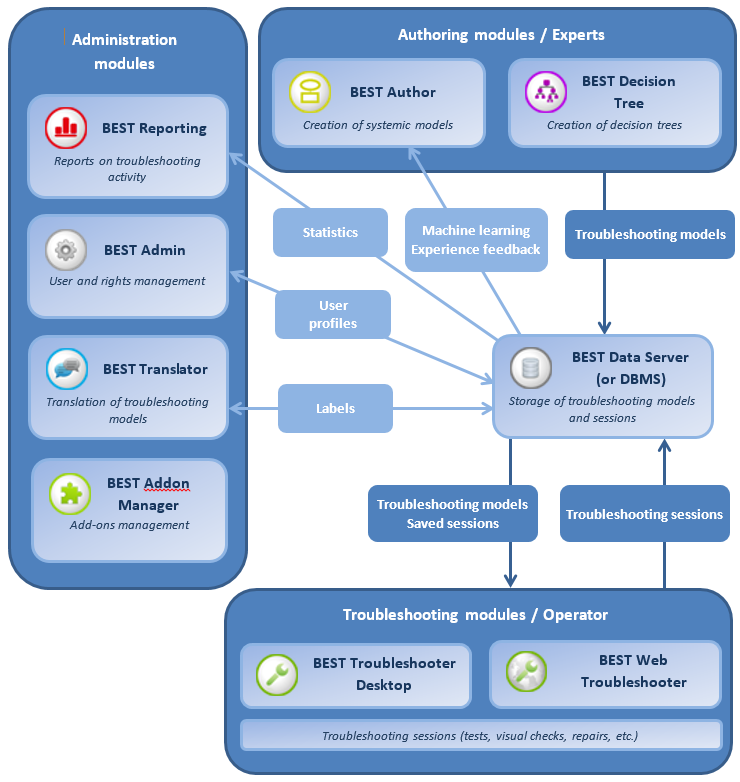 Authoring Modules are used to develop and deploy troubleshooting models. Administration Modules allow to configure and monitor the BEST software suite. For more information about BEST, please contact us at best-cs@bayesia.com.